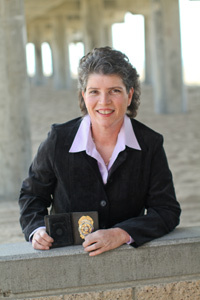 Janice Cantore is retired from the Long Beach Police Department after 22 years of service, with sixteen in uniform and six as a non-career officer. Janice worked a variety of assignments including patrol, administration, training, and juvenile investigations. During the course of her career in uniform, Janice found that faith was indispensable to every aspect of her job. Once retired, she began writing novels. Accused (Tyndale House, 2012) is the first installment in her new suspense offering, The Pacific Coast Justice Series. Abducted (Tyndale House, 2012) is the second and most-recently released installment. Cantore writes suspense novels designed to keep you engrossed and leave you inspired. She has a bachelor’s degree in biology from UC Irvine and one in physical education from CSULB. She is also a member of American Christian Fiction Writers and Sisters in Crime.